Today’s 5 star secret recipe comes from the Purple Yam in Brooklyn, New York. This creative Pan-Asian spot best known for its takes on rarely encountered traditional Filipino fare. 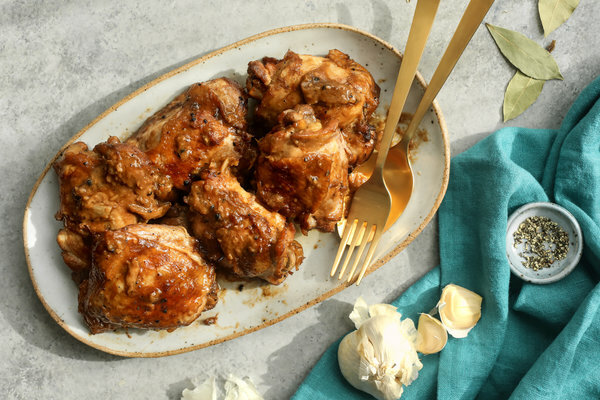 Chicken adobo is the national dish of the Philippines. Braised in vinegar until pungent and rich, sweet and sour and salty at once, then sometimes crisped at the edges in high heat, and always served with the remaining sauce. Combine all of the marinade ingredients in a large, nonreactive bowl or resealable plastic freezer bag. Add the chicken and turn to coat. Refrigerate overnight or for at least 2 hours. Place chicken and marinade in a large lidded pot or Dutch oven over high heat and bring to a boil. Immediately reduce heat to a simmer and cook, stirring occasionally, until the chicken is cooked through and tender, around 30 minutes. Heat broiler. Transfer chicken pieces to a large bowl, raise heat under the pot to medium-high, and reduce the sauce until it achieves almost the consistency of cream, about 10 minutes. Remove bay leaves and chilies. Place chicken pieces on a roasting pan and place under broiler for 5 to 7 minutes, until they begin to caramelize. Remove, turn chicken, baste with sauce and repeat, 3 to 5 minutes more. Return chicken to sauce and cook for a few minutes more, then place on a platter and drizzle heavily with sauce.